There’s nothing more frustrating than rushing out to your car and realizing that you left your headlights on and now your battery is completely dead. There may be a few lights working on the dashboard, and you may hear the clicking of the starter as you try to turn over your vehicle. Even if you have a pair of jumper cables, unless you can find a friendly neighbor who is willing to give you a jump, getting your car started once the batteries is dead is going to be a challenge. We’ve been there and know how frustrating it can be. For this reason, we are happy present you with a list of the best battery jump starters that are currently available on the market. We rank these starters gold, silver, and bronze. At the end of our review, we are going to add one budget product that may not have all of the features as the more expensive options, yet it will get your car started when you need it for a less expensive price. When you find yourself with a dead battery, you want to get your car started, and you want to get yourself on the road as soon as possible. The Schumacher jump starter is designed to help you do just that. To refer to it as a powerhouse is an understatement. The first feature that caught our eye is that it has 2,200 Peak amps. That’s nice, but what takes it to the next level is that it has 330 cranking amps. The Schumacher model we are reviewing is a lot more powerful than the smaller JNC300XL. If having your car battery not start is bad enough, it’s even worse when it doesn’t start in the cold weather. The cold weather can drain the energy out of your car’s battery and can slow down in the charging process. The Schumacher jump starter has 275 cold cranking amps specifically designed to get your car going during subzero temperatures. The next feature that we looked at was the clamps. These are heavy duty. You’re not going to worry about them not making a good contact or adhering to your automobile’s battery. If for any reason they should break, they are damaged, or they need to be replaced, it is easy to switch out the copper jaws on the jump starter with new ones. Of course, if this machine is going to be able to deliver the power you need to get your automobile started even in the coldest weather, you’re not going to expect it to be super light. However, at 25 pounds, it is not so heavy that you cannot move it around to where you need it to be. Its dimensions make it portable. It’s 14 x 4.7 x 15.2”. You can shove this starter in your trunk, in the back of your car, or anywhere you need it. It will work just as well on the rusty tractor that you have in the back of the barn as it will on a powerful V-8 engine. The idea is that this piece of machinery is designed to make sure that no matter what your drive and no matter where you are, you will never worry about being stranded. 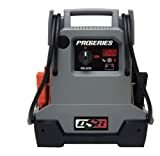 This apparatus comes equipped with a 12 V DC power outlet, a built-in automatic charger, and a 22 Ah professional grade high output AGM battery. Sometimes, in the frustration of trying to jump your car, you may accidentally put a negative lead on a positive, and vice a versa. To help protect you from this, the starter comes with a reverse hook up alarm. The unique design of the starter makes it perfect for use tailgating, camping, or anywhere that you need portable power. Another nice feature is the smart charger. This allows you to plug the unit in and its internal battery will reach a full charge. Then, it will turn to trickle mode. This allows the battery to maintain a charge without damaging the battery. You can leave the battery plugged in as long as you want to a 110 V plug-in and nothing bad is going to happen to it. In fact, when you look at the user manual, it recommends that you keep it plugged in between uses. Many of the reviewers on Amazon.com fell in love with this product. More than 500 people reviewed it and gave it 4.5 out of 5.0 stars. What’s most impressive is that 75 percent of the individuals who reviewed the product gave it a perfect 5.0 out of 5.0 stars. One of the reasons why it was rated so highly is because it comes with a one year from the date of purchase warranty. The manufacturer will repair or replace the product with a new or reconditioned unit. In addition to providing the buyer protection, this warranty makes it clear that the manufacturer believes in the product they are selling. One reviewer said it works great and that they would buy another one in a heartbeat. Another reviewer referred to this as the best jumper box. They said they’ve started quite a few trucks already and that they could not ask for anything better. Another reviewer mentioned that they appreciated the nice features of the starter, including its ability to measure the voltage on both batteries and the automobile’s alternator performance. This is a quality unit that is designed to keep you on the road whether you left your lights on and drained the battery or if your battery was strained as a result of cold weather. 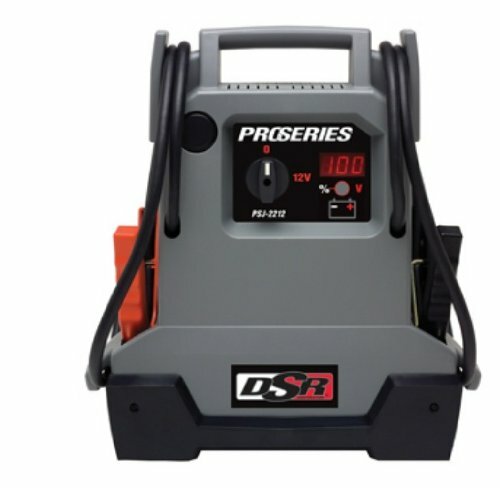 The Schumacher PSJ-2212 DSR ProSeries 2200 Peak Amps is a beast of a machine. It can be used to jump start almost any vehicle. It is also the perfect way to access power when you need it for charging small devices. 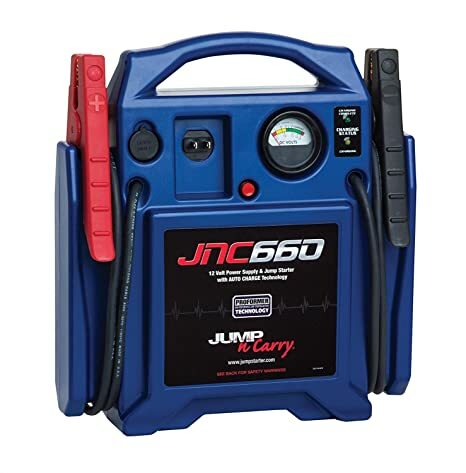 When we selected the Jump-N-Carry Jump Starter as our silver product, we did so because we were impressed by a lot of the features that this product had to offer, including its 1,700 Peak amps of jump starting power. This is a strong and solid tool. You’re going to be impressed by the 425 cranking amps. It is strong enough to turn over the majority of engines even when the weather is sub zero. As we reviewed all of our jump starters, the cranking amps were something that we paid attention to because as anyone who has tried to start their vehicle in the cold weather knows, the colder the weather, the harder it is to get the engine to turn over. This means that the battery charger needs to be able to supply power for an extended period of time to get the car going. Another feature that we looked at was how portable the jump starter was. The nice thing about the Jump-N-Carry is that it has multiple places for you to store cables. On each side of the device, there is a place where the 46 inch jumper cables can be stored. The length of the cables was another feature that caught our eye. Forty-six inch cables means that you can reach batteries no matter where they are located inside of an engine. Something that’s good to note is that there is not a power switch. So the cables need to be separated and stored correctly to prevent them from contacting each other and sparking or presenting a safety issue. While we’re on the theme of portability, the Jump-N-Carry is easy to transport. It is a touch lighter than the gold product we reviewed since it only weighs 18 pounds. It is compact, with dimensions of 16.3×14.1×5.1 inches. Since the unit is so small, it can fit in the trunk of your car or just about anywhere you need quick access to battery power. The Jump-N-Carry is unquestionably a must-have accessory for any car owner, especially if they are driving around during winter months. One downside with this device is that it does not have some of the safety features you will find on more elaborate devices. For example, there is not a feature to detect the reversal of polarity, which happens if you accidentally connect the jumper cables improperly. So this means that you’re going to have to pay attention before you try to start the car, or you might permanently damage your battery. The device come equipped with an easy-to-read test gauge that can show you the remaining charge in your batteries. This is a great tool to have, especially if you’re trying to figure out whether or not your aging battery has a problem holding a charge. Thanks to its one-year warranty, which starts on the date of purchase, you will be able to test the charger and see for yourself how good a product it is. And if there is any defect, you know you can return it to the manufacturer and have the unit repaired or replaced. On Amazon.com, more than 2,200 individuals reviewed the product. Eighty-three percent of them gave the product a perfect 5.0 out of 5.0 stars. Some of the reviews for the product include things like one reviewer who said that the product was well worth it. He went on to say how it was a great asset and thanks to this product his automobile was up and running in just a few minutes. Another reviewer said that this product not only looks great, but it also charges fast. One reviewer who gave the product five stars said that it was really worth the buy, and they wish they had purchased one sooner. 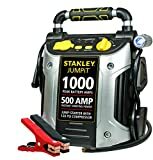 The Stanley jump starter is a compact powerhouse that is able to successfully do the job for a sedan, tractor, or RV. It can go wherever you need to go. The first thing you’ll notice about this product is just how portable it is, weighing only 18 pounds. Its dimensions are 11.2×8×13.5 inches. So you will have no problem fitting this into the trunk of your automobile. While this starter does not have the same power as the other models we have already reviewed, there are other features that made us feel it merited the bronze product rating. First, it has 500 A of instant starting power. Couple that with 1000 peak battery amps, and you should have no problem getting most passenger vehicles started, even in cold weather. However, the features of this device do not end there. It also has a 120 psi air compressor. So if you get a flat tire, you can get back on the road quicker. It also has charging stations for both USB and DC appliances. Since most emergencies seem to happen at night, you will appreciate the fact that it comes with a high powered LED light. It can rotate 270°. So as you can see, even though this unit does not have the same amperage as some of the more expensive or higher rated models, it is the complete package. It is the one tool that you want to have on hand when you find yourself stranded in just about any situation. As you would expect, the reviewers on Amazon loved the product. The product was reviewed by more than 2,200 individuals, and 62 percent of these individuals gave the product a perfect 5.0 stars. One of the things that they loved about this device was that in addition to all of its features, it also has a reverse polarity alarm. This means that you will not accidentally damage your battery by putting the charging cables in the reverse position on your battery. This item is considered hazmat. So once you purchase it, it cannot be returned. The parts have a one year warranty. The manufacturer will replace the product or repair it at no charge if it is damaged within the warranty time frame. Some of the reviewers on Amazon refer to this as a reliable and great product. One reviewer said that he loved not needing to worry about flagging someone down and getting them to jump his automobile. He has used this device on his car, and it works like a charm. He referred to it as a lifesaver. Some users have complained that the power switch for the air compressor on the back is not protected. If you accidentally leave it flipped on, you could drain the power in the unit. So when you need to use the unit to charge your batteries, it might be dead. 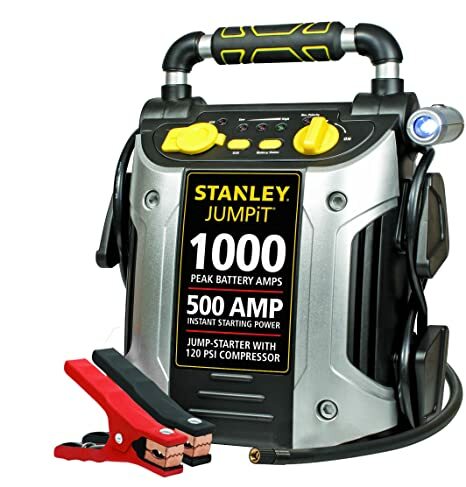 Outside of that, people really enjoyed using the Stanley J5C09 1000 Peak Amp Jump Starter with Built in Compressor. They found it to be a reliable tool that saved them a lot of hassle when they were in an emergency situation. 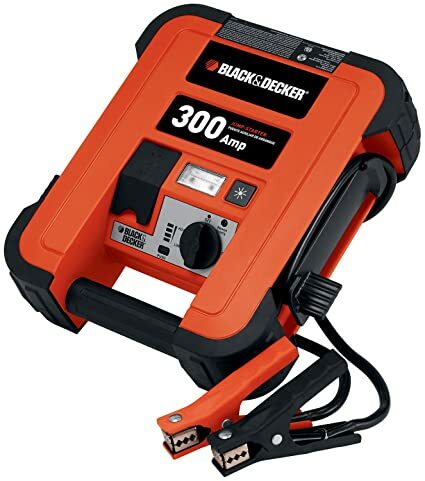 This Black & Decker model offers many of the features that our gold, silver, and bronze products offer, but it is set at an affordable low price and definitely gets the job done. The 600 peak amp offers 300 instant starting amp, which means you will never be left stranded. Its small design allows you to easily store it in the trunk of your car or in your garage. It weighs 8.6 pounds, and its dimensions are 4 x 11.2 x 12.2 inches. You will have no problem storing it with other tools in your vehicle, or it can easily squeeze on any household shelf. Some even decide to store this under the seat of their car or truck. One thing that you will definitely appreciate about these jumper cables is that they have audible and visual reverse polarity alarms. This means that you will see and hear a warning when improper connections are made to battery terminals. This is something that is helpful for individuals who do not use jumper cables often or who are trying to jump their vehicle in the middle of the night. The ultrabright lights are also great for when you have that car emergency in the middle of the night and you are stuck in a dark parking lot trying to get your vehicle going. Another feature that makes these jumper cables easy to use are the cables and clamps that store easily on the unit. Amazon reviewers definitely feel like this is a useful tool. About half of the individuals who wrote reviews gave this product a perfect five out of five star score. Overall, this set of jumper cables has a 4.0 out of five star rating. Some of the features that individuals like most about this product include the fact that it is easy to operate, it is very portable, and it works flawlessly on smaller batteries. Most agreed that it is enough to get you out of trouble. One thing that a couple of reviewers mentioned is that this product is great for the jump starter part, but they were not impressed with the tire inflator. They felt like the internal battery on the jump starter worked great and was made well. However, they felt like the weak link is the tire inflator. They said that it overheated quite quickly and did not work well after several uses. They only gave the product three stars, but said they would have given it five if it wasn’t for the inflator. A couple of individuals commented on the fact that they did not like that it did not come with a power cord to charge the unit. Other individuals mentioned that it works great the first time after a charge, but needs to be charged again if it will be used a second time on the same charge. Overall, we feel and Amazon reviewers feel that this is an inexpensive, but quality product. Purchasing the product will not break the bank and will get you out of a tight spot when you need it. The majority of jump starters can start a car at room temperature. The true test of its functionality is its ability to get your car running when the temperatures have dropped below zero. Read reviews and check ratings for cold start amperage to determine which battery pack is right for you. Just about any unit can start a cold battery when the unit is at room temperature. But since you will often store your unit in the trunk of your vehicle, you want a unit that is able to get your vehicle going when both the automobile and the unit itself is at below zero temperatures. How Well Does It Stand up to Heat? On a hot summer day, the temperature inside your trunk can reach in excess of 150°. Some units are only designed to withstand up to 120°F. This means that if you do not buy the right unit, simply storing it in your trunk can damage it. In addition to starting your automobile, these devices can be used to charge your laptop, your cell phone, and other appliances. Make sure that the device you purchase has the ports for the devices you want to charge. Many units come with an air compressor. This can be a lifesaver, especially if you find yourself stuck in the middle of nowhere and far away from a gas station. Purchasing a unit with a built in flashlight is a must. It is especially important since so many automobile emergencies happen at night. Automobile emergencies, especially those involving a car that will not turn over because the battery is dead, usually happen at the most inopportune times. You’re usually by yourself, and there is no one around who you can ask for a jump. For this reason, having a battery jump starter in your vehicle is a great idea. It takes away a lot of the stress and frustration that come from not being able to get your car started when you need to get going. It is definitely a good idea to do as much research as you can on the product you’re going to purchase. This especially case if you live in an area that has cold winters. Just about any unit can get a warm automobile started, but not every jump starter can get a cold vehicle going again. We hope our review has given you a good idea of some of the options that are available on the market, as well as a good idea of the most popular features these items offer.